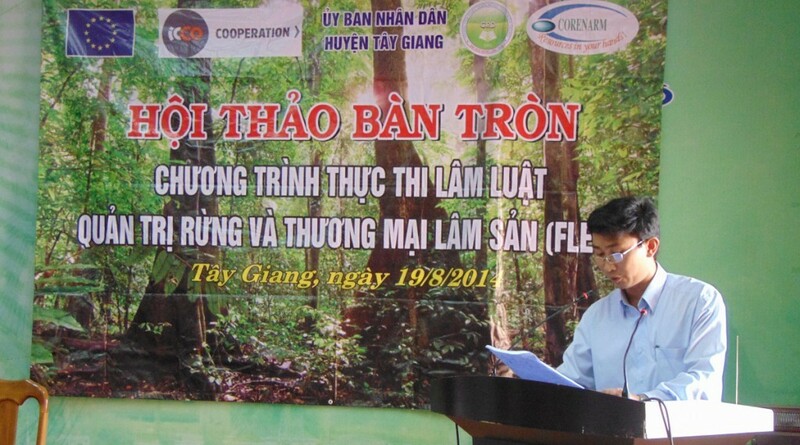 Funded by The European Union (EU) and ICCO organization (The Netherlands), on 19 August, 2014, FLEGT project in Central Region in cooperation with Quang Nam Union of Science and Technology Associations (USTA) and the People’s Committee of Tay Giang District held a roundtable workshop on “Forest Law Enforcement, Governance and Trade Program” (FLEGT) in Tay Giang District, Quang Nam Province. The workshop was within the series of 04 roundtable workshops on FLEGT program. The workshop aimed to introduce about FLEGT Project in Central Region, to give information about the process of negotiations and implementation of Voluntary Partnership Agreements on FLEGT program ( VPA/FLEGT) and especially to collect comments or recommendations on FLEGT program from the stakeholders to submit to policy makers for the negotiations and implementation of VPA/FLEGT. “Quang Nam is a province with great potentials in forest resources and forest land. In recent years, Quang Nam has planned and established economic woodlands growing industrial plants like acacia, rubber trees, and so on in mountainous districts. That not only creates jobs and increases stable incomes for local people but also meets the needs of plants for materials for the development of timber processing industry”, said Mr. Nguyen Van Dieu – Vice President of USTA in his opening speech at the workshop. Through the workshop, Mr. Truong Si Hoai Nhan – Director of FLEGT Project together with consultants of FLEGT Project provided to all participants information about “FLEGT Project – Central Region” as well as information on “The process of negotiation VPA / FLEGT agreement between the EU and the Vietnamese Government in implementing the program of Forest Law Enforcement, Governance and Trade Program (FLEGT)”. In order to discuss to collect information, and opinions of the delegates on the content: “How to contribute to enforcing of VPA/FLEGT and benefits when involving this Agreement”, the oganization department divided the participants into 04 groups, including: (1) Group of households who planted, managed and protected forests; (2) Timber processing enterprises; (3) Forest Protection Agency and (4) Civil Society Organizations. FLEGT Project summarized some comments of the participants as follows: Group of households who planted, managed and protected forests considered that: “During the logging of planted forests, timber processing enterprises complete the document procedures on purchase of timber. There is only a purchase agreement contract between people who planted forest and timber processing enterprise. Therefore, after selling the timber, forest planting people do not have an archive to verify the origin of timber. This is one of the difficulties for forest planting households when they are required to prove the origin of legal timber logging.” Group of timber processing enterprises shared that: “There are no large timber processing enterprises or sawmills in the district area but only civil carpentry processing shops providing civil wooden products local people.” Some difficulties claimed by the groups were that most of the carpentry processing enterprises in the area had no business license for wood processing. As timbers are purchased primarily from people, there were no records or proofs to verify the origin of legal timber. If the enterprises failed to present the documents proving the origin of legal timber when required by the market management agencies and forest protection agencies, they would be fined and their timber would be seized. Through this workshop, these enterprises expressed their hope to receive support, consultancy and guidance from the State management agencies on the procedures ensuring the verification of timber origin. As for the group of Forest Protection Agency, they shared some problems in checking and transporting timbers of planted forests as follows: “Although templates of Forest Products List are available, not everyone is able to complete, especially the ethnic minorities in mountainous areas. That causes a lot of difficulties when checking documents on transportation, as besides checking forest products list, we have to check records of planted forests to ensure accuracy. In some local midlands with large areas of forests, several demands of people to certify the origin of forestry products created great pressure on local forest protection officials”. In addition, the group of civil society organizations claimed that as a bridge between the authorities and the local people, it is suggested that FLEGT project draw up an appropriate communication plan to provide information, and hold training courses to raise the awareness of the officials and ethnic minority people in mountainous areas on the negotiation and implementation process of VPA / FLEGT. Through the workshop, the FLEGT PMU has collected many comments and opinions from the participants, which would be summarized and sent to Vietnam Administration of Forestry to contribute to the recommendations for the process of VPA/FLEGT negotiation and signing between the European Union (EU) and the Government of Vietnam in late October, 2014.